• If you linked to our website from another website, the address of that website. We use this information to help us make the site more useful to visitors -- to learn about the number of visitors to our site and the types of technology our visitors use. We do not track or record information about individuals and their visits. If you choose to provide us with personal information -- by filling out a form with your personal information and submitting it to us through the website -- we use that information to respond to your message and to help us get you the information you have requested. We only share the information you give us with another government agency if your inquiry relates to that agency, or as otherwise required by law. 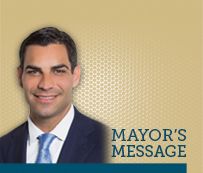 The City of Miami does not collect information for commercial marketing. The State of Florida law requires that if requested, any information we collect must be disclosed to the requestor under section 119.07 of the Florida Statutes (Public Records Act). You may decline participation in any activity that asks for information (i.e., surveys or emails). Your choice to not participate will have no effect on your ability to access information on the Cityâs web sites. To better serve you, we occasionally use "cookies" to customize your browsing experience. Cookies are simple text files stored by your web browser and they provide a method of distinguishing among visitors to the web sites. Cookies created on your computer by using our web sites do not contain personally identifiable information and do not compromise your privacy or security. We use the cookie feature to store a randomly generated identifying tag on your computer. If you have further questions about cookies, the Computer Incident Advisory Capacity Unit that monitors computer problems for the U.S. Department of Energy issued a study on March 12, 1998, of the risks to users of cookies, titled "Information Bulletin 1-034: Internet Cookies". You can refuse the cookie or delete the cookie file from your computer at any time by using any one of a number of widely available methods. Your choice to refuse the cookie will not inhibit your access to any of the information available on the City web site. Your acceptance of the cookie will serve to provide you with additional functionality in choosing the information you wish to view on a regular basis. In certain instances, you will have the opportunity to receive or create a password to access or submit personal information. You should not divulge your password to anyone and the County will never ask you for your password in an unsolicited phone call or e-mail. When you are finished with those applications that are password protected, you should exit the page. Under Florida law, e-mail addresses are public records. If you do not want your e-mail address released in response to a public records request, do not send electronic mail to this entity. Instead, contact this office by phone or in writing. See Sec. 668.6076, Florida Statutes. Click here to review a list of departments and offices in the City.